Building a good social media presence doesn’t have to take all your time. You just need to work smart, and focus on the activities that produce the highest ROI. Because you’ll start to notice that specific activities pay off a lot more than others. Here’s how you can identify those activities, grow your audience, and save yourself a ton of time in the process. The most common mistake people make is not defining their social media goals before they begin. Why are you on Twitter? What are you doing with your blog? And how are these activities going to support your professional goals? Forget about the ROI. I’m talking about being able to define what success will look like. Even today, if you asked most companies why they’re using social media, they won’t be able to give you a straight answer. If you can figure out how your daily activities will support these three goals, then you’ll already save yourself a lot of wasted effort. If you’re looking for quick growth on a new social network, then you should funnel fans from an existing channel. Just be careful… because you don’t want to be guilty of digital sharecropping. But if you’re looking for a temporary way to get a quick win, then this is your best shot. There’s almost never a reason to spend longer than 20 minutes on social networks at one time. So instead of wasting hours with TweetDeck notifications going off every 5 minutes, break your day up and check-in and out of social media for 20 minutes, three times a day. You’ll be more active throughout the day, and each time you check-in you’ll have a purpose because you have no time to waste. You can set an alarm, or use a time tracking tool like RescueTime to help you manage that 20 minutes effectively. Social media provides you with a great opportunity to reach more people. But it will take over your life if you let it. If you don’t come up with a plan for managing social media, then it will manage you. Have you figured out how to use Google+ for your business? But it’s going to have a huge impact on SEO, so I guess we have no choice. Take a look at how other early adopters are having success already, and figure out how you can use Google+’s unique features to create a new experience for your audience. For example, BlogcastFM runs a focus group on their Google+ page, while SEOmoz creates unique video content that you can’t find anywhere else. Look at how other people are using Google+ to get some ideas, but you should ignore your competition. Instead, look at what people in other industries are doing and try to come up with a fresh approach. If you want to succeed in social media, then you need to do more of what people like, and less of what they don’t. Pretty obvious, huh? But most people just post random updates that don’t support their goals (see #1). Instead, take advantage of the Facebook formula to virally grow your audience. The big problem on Facebook is that you can’t reach all of your of your fans. It doesn’t matter if you have millions of fans. If you don’t have engagement, then you will never defeat Facebook’s EdgeRank. So start taking advantage of the tools that Facebook gives you and figure out what your audience really loves. Then give them more. When you start following over one hundred people on Twitter, the Home Feed becomes useless pretty quickly. Instead of wasting time trying to keep up with every conversation, you should create private lists of the people and companies you want to watch. These could be special groups of bloggers that you want to include in a future social media promotion, or a list of companies that you want to reach out to. Lists will help you manage the conversation, and you can easily jump in (during your short 20 minutes) to follow what these important people are up to. 7. Schedule Updates to Go Out Automatically. Have you ever fallen victim to someone’s avalanche of Tweets? It’s not pretty. Instead of bombarding your followers, use Timely or Buffer to spread those tweets out during the day. Besides common courtesy, they’ll also help you achieve better results by maximizing your click-through-rate and engagement. You can also use Hootsuite’s “batch update” feature if you have recurring status updates you’d like to send out over a period of time. And if youâ€™re using WordPress, then you can use the Tweet Old Post plugin to send out posts from your archives. Don’t just share your own content. 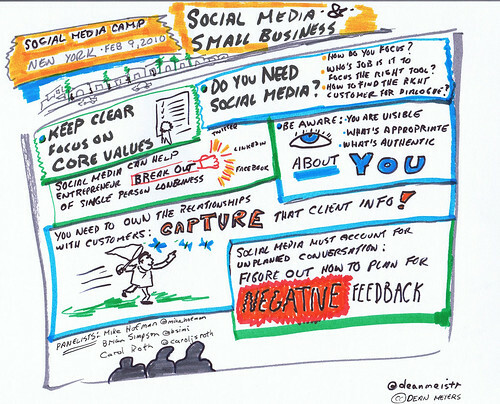 Content curation is at the heart of a good social media strategy. No matter what business or industry you’re in, you want to become a thought leader. It also helps you build an audience and connect with other people. Your Twitter followers and Facebook fans are different. There isn’t a lot of overlap. So while you can update Twitter 30 times per day, Facebook probably maxes out around two. Instead of spamming every network with the same message, use your stats from Buffer or Timely to identify and cross-promote your best stuff. You should also tailor each update for the specific channel. For example, Twitter gives you 140 characters, so you need a short, snappy message. Facebook gives you a little more room, so you can elaborate with a short description. But Google+ is unlimited and has high engagement, so you can summarize the content and add attractive photos or videos. Maximize the value you’re getting out of each update, and the results will add up over time. Finally, there are two ways to build a large social network audience. One way is to start from the bottom and try to build your presence organically. You start by tweeting to an empty room, try to engage the few followers you have, and participate in Twitter chats. This strategy takes perseverance and hours of effort. But it’s pretty inefficient. Work from the top-down. Start guest posting on larger media sites. Reach out to other bloggers and try to run a promotion for their audience. Interview influential people in your niche. This is the new social media definition. If you want to grow a brand, then focus more on business development instead of community management. It’s far more effective in the long run to build your brand (and traffic) first. Because when you’re good enough, the social media audience will follow.